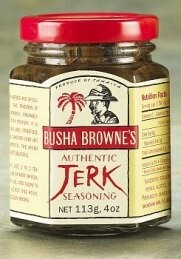 An authentic jerk rub for meat, chicken or fish. 4 oz. JERK is a method of curing or preserving meat by slicing it into strips and drying these in the sun or over a fire. Jerked meat is common to different cultures, but Jamaican jerk is unique. The meat is highly seasoned before being smoked on a grill. Jamaican jerk was developed over 300 years ago by the Maroons. When the British invaded Jamaica in 1655 the Spaniards fled to Cuba leaving behind their slaves, who ran away and hid in the mountains. Known as Maroons, the runaway slaves avoided capture by moving about from place to place. While on the move, the Maroons lived on wild boar which they captured. They developed a method of seasoning the meat and then smoking it over a fire on branches of the pimento (allspice) tree. In 1739 the British signed a treaty with the Maroons granting them lands and virtual independence. Jamaican jerk was the Maroons' gift to us. Busha Browne's Authentic Jerk Seasoning is a blend of herbs and spices including Jamaican pimento (allspice) to create a 'hot' rub. The aroma is irresistible and the taste delicious.